With approximately 20% of babies, toddlers, and children affected by eczema, a skin condition also known as AD or atopic dermatitis, it’s no wonder there’s an overabundance of information out there. But even with the research studies, the data, treatment and diet recommendations, it’s hard for a parent – especially a new parent – to know what to do. Many children outgrow their eczema issues; some need to manage it as adults. But the right skin regimen and toddler eczema treatment now can give your baby a foundation of protection for years to come. Eczema usually shows up in the first 1-5 years of a child’s life. You’ll rarely see it at birth, but a baby can show signs as early as six weeks old. The face and outer parts of the arms and legs are common places for rashes to appear. Scalp, feet, and hands are other areas sometimes affected. 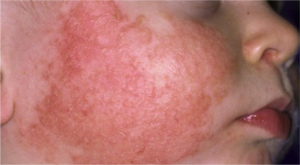 The eczema rash itself can vary from child to child, but it usually is an uncomfortable-looking patch of dry, rough, sometimes scaly or red, irritated skin. The biggest telltale sign for you as a parent? Other rashes will eventually go away, but eczema is stubborn and will keep coming back. Eczema is hereditary, usually connecting back to a parent or family member who has eczema or even hay fever or asthma. Before you beat yourself up, however, know that the line is dotted — a child can have eczema and be the only one in the family. There’s a strong connection between food allergies and eczema. If your child has moderate to severe eczema, allergy testing is recommended. While not curable, eczema is controllable. The right skin regimen, especially during summer and winter months that are hard on the skin, can make all the difference. Bathe your baby – a common myth is that you shouldn’t bathe children with eczema. However, clean skin is less prone to infections and other germs. Keep baths short (less than five minutes) using lukewarm water and a gentle, ph-balanced soap like Pibu’s™ Bathtime Wash.
Moisturize your baby – eczema is all about dry skin, so moisture is critical to protecting the skin barrier. After bath time, pat your baby dry to reserve some of the water and then moisturize head to toe. Pibu’s™ Hydrating Ointment, a fragrance-free, intensive moisturizer is perfect for locking in moisture after a bath. Repeat in the morning as well, using a lubricant like the Hydrating Ointment that can help in the treatment of your toddler’s eczema. If you see signs of eczema, increase the regimen, using an allover moisturizer at least twice a day. Soothe the affected areas with an added treatment such as with the Hydrating Ointment. If the symptoms don’t subside in a few days, contact your doctor. Sometimes, a corticosteroid – a good steroid that the body produces naturally – can ease the inflammation and irritation. Doctor’s Instructions: For signs of eczema, extra dry skin or chaffing, replace daily moisturizer with Pibu’s™ Hydrating Ointment. Apply liberally with hands by massaging all over baby’s skin twice per day, concentrating specifically on affected areas. Great for drool rash, diaper area, skin folds, cheeks and lips on wintery days and even mommy’s cuticles! Warnings: For external use only. Avoid contact with eyes. Stop use and ask doctor if condition worsens or symptoms persist for more than seven days. Do not use on puncture wounds, animal bites or serious burns. Doctor’s Instructions: Apply to severely dry, inflamed and eczema-affected areas no more than three times per day. Do not use for diaper rash. For treatment of infant, toddler, and childhood eczema. Warnings: For external use only. Avoid contact with eyes. Do not use for any other purpose without consulting a physician. Stop use and ask a doctor if condition worsens, bleeding occurs, or symptoms persist for more than seven days. Keep out of the reach of children. If swallowed, contact a physician or poison control center immediately. We stand behind our products and customer satisfaction is our goal. If you are not completely happy with your purchase for any reason you may return it. We ask that you do so within 14 days of receipt. Simply email us at careteam@babypibu.com to request a refund. After receiving a confirmation email from us, send us the product in its original packaging and a copy of the original invoice. Please include your contact information so we can expedite the return.